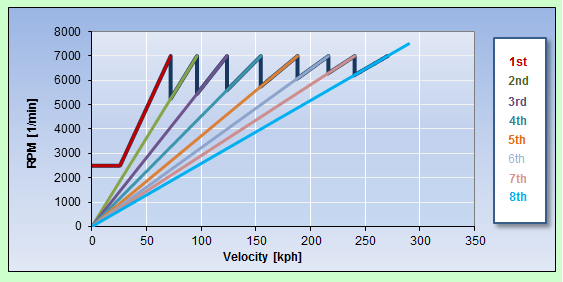 DYNATUNE-XL does offers also "Longitudinal Dynamics Tools" which are in this ACCELERATING & BRAKING section explained. 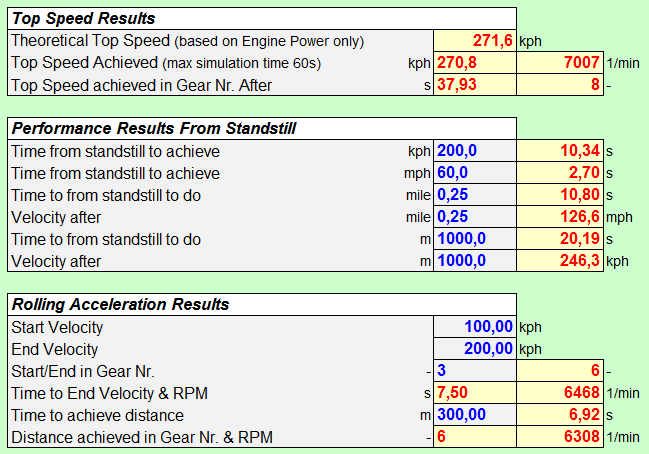 Two highly efficient tools have been developed for those people that need to modify their gear ratio's and get the best acceleration package with their available engine or want to improve/design the braking system and verify it's performance. The tools have recently been added to the product portfolio and are focused - as all DYNATUNE-XL tools - to deliver a maximum of information with a minimum of required input data. 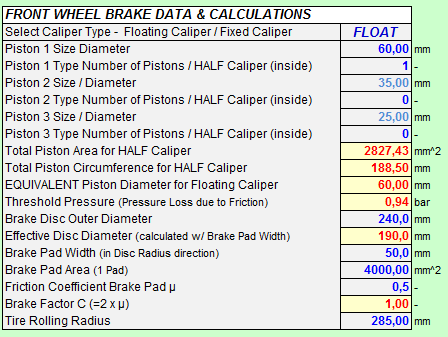 In the Brake System Module the most important data to be supplied are Brake Disc Dimensions, Caliper Piston Diameters and Master Cylinder / Brake Pedal Data . 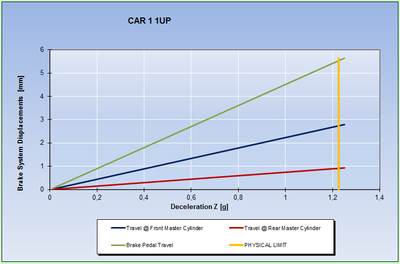 The tool allows to investigate two vehicles in two load conditions and compare their key performance characteristics. 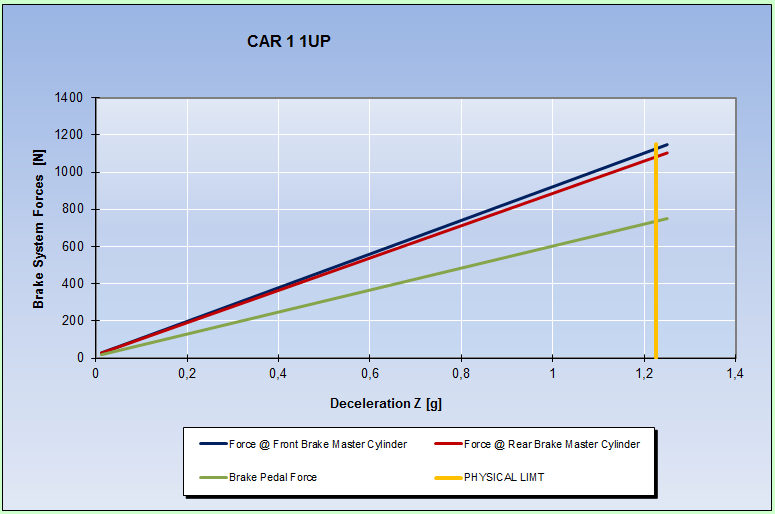 The Tool is designed for Caliper/Disc Systems, does NOT consider any Brake Boost Devices and is governed by a Brake Balance Bias Bar which defines the Brake Distribution between the Front and Rear Axle. 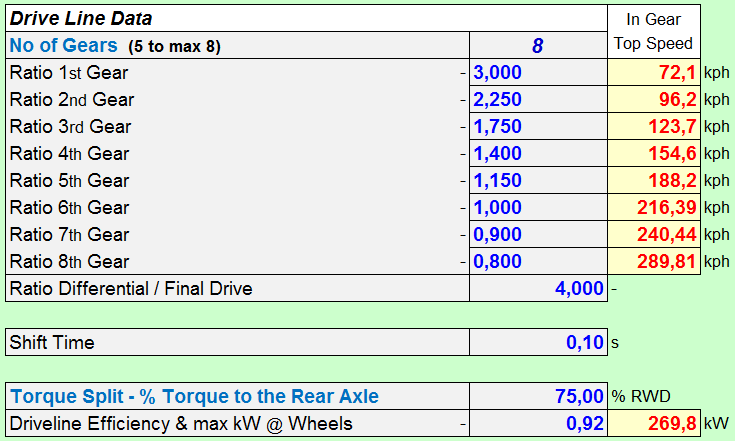 As to be expected, the main Brake System Data to be supplied are those of the Brake Calipers and Discs. The calculation algorithm is based on the principle of a 1 Piston Floating Caliper (piston located at the inside of the disc) and will convert all data of Fixed (multi-piston) Calipers to that principle. Up to 3 different sizes of pistons can be used allowing maximum flexibility in geometric design. 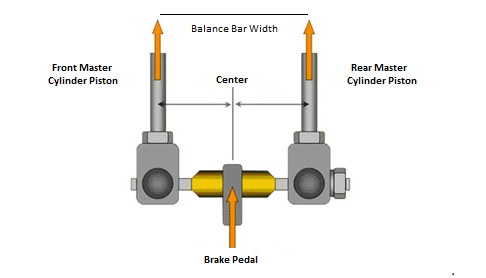 Next to the data for Front & Rear Wheel Brakes, the Master Cylinders Dimensions have to be provided and some basic geometry data of the Brake Balance Bias Bar. 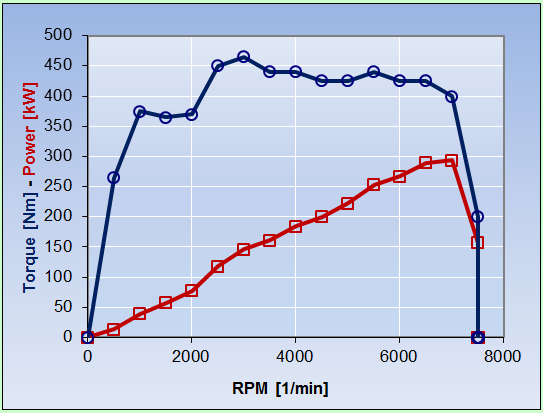 And some Specific Data to consider the effects of Piston Friction and Brake Pad Deformation. 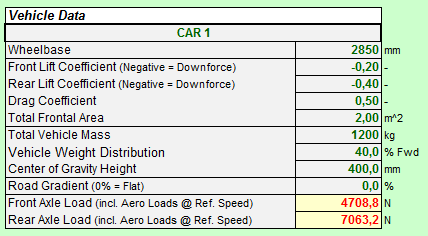 The most important vehicle data are of course Vehicle Mass, Weight Distribution, Center of Gravity Height and Wheelbase since these parameters define the longitudinal load transfer and wheel loads under Braking. Additionally the tool can consider two load conditions of the vehicle. 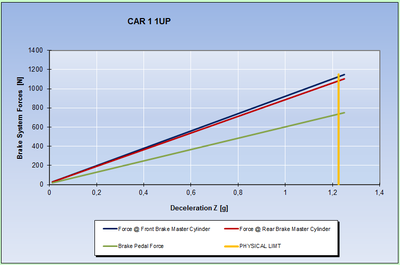 It should be mentioned that the tool is fully capable of simulating high down force vehicles and considers the effects of especially high (negative) Lift & Drag Coefficients on Braking Performance. 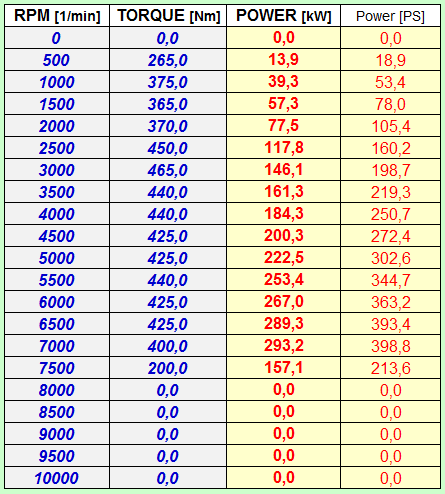 The axle loads are generated for the imposed speed. 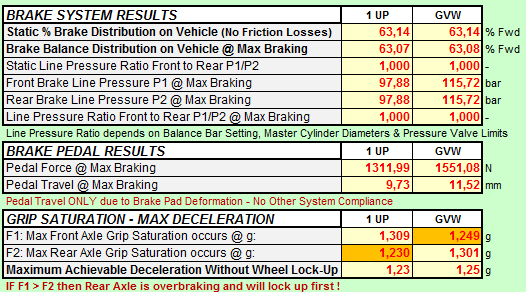 Beyond that all interesting details of the Braking System are available as intermediate results. A Brake Pressure Control Valve can limit the maximum Brake Line Pressure if needed. 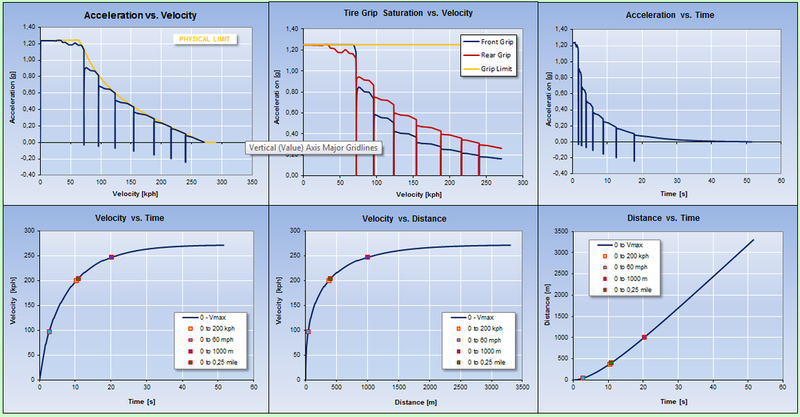 GRAPHICAL RESULTS consist out of 3 Graphs from which the classical Axle Grip Saturation vs. 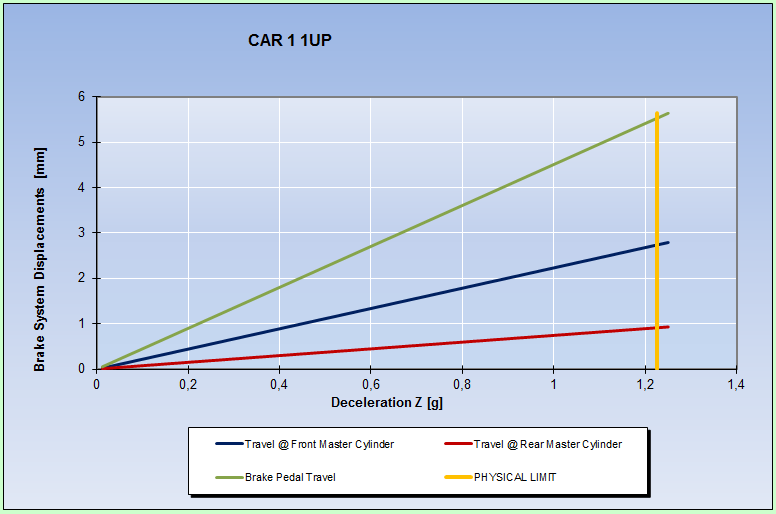 Vehicle Deceleration Graph is the most important. 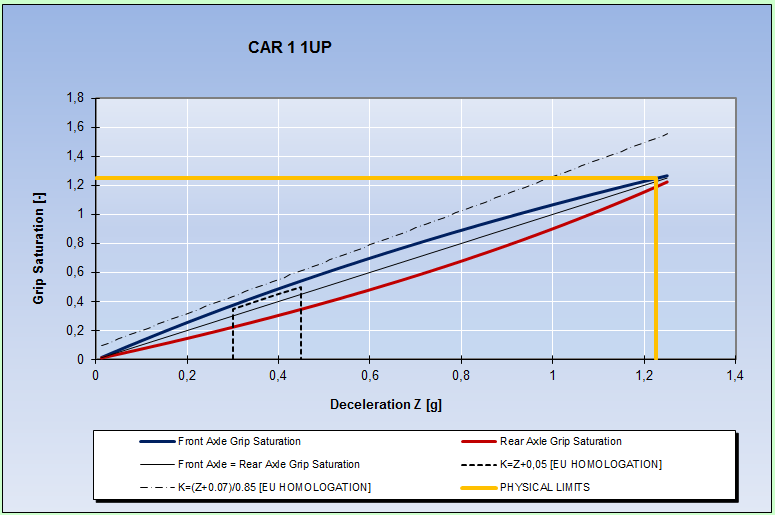 The other Graphs show Brake System Actuation Forces and Displacements..All Graphs contain an indication of the Physical Limit of the Vehicle. 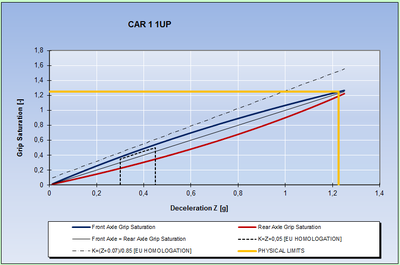 Beyond that, some of the EU-Homologation requirements are considered in the first graph as a reference guide for street legal vehicles. 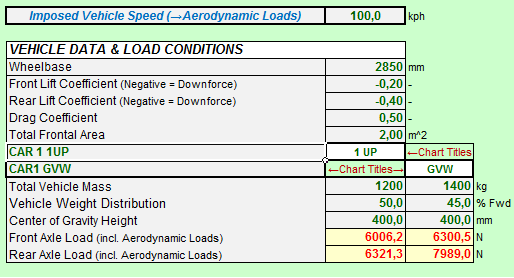 This workbook contains also a COMPARISON Sheet in which all key Parameters and Graphs for 2 Vehicles (and their 2 load conditions) are listed allowing an easy back to back comparison of variants. Have a look at the BDM PDF file to find out more about it.